JFH News: Philadelphia-based Christian singer-songwriter Christa Deana Releases New Single and Lyric Video for "If God Doesn't Want It." 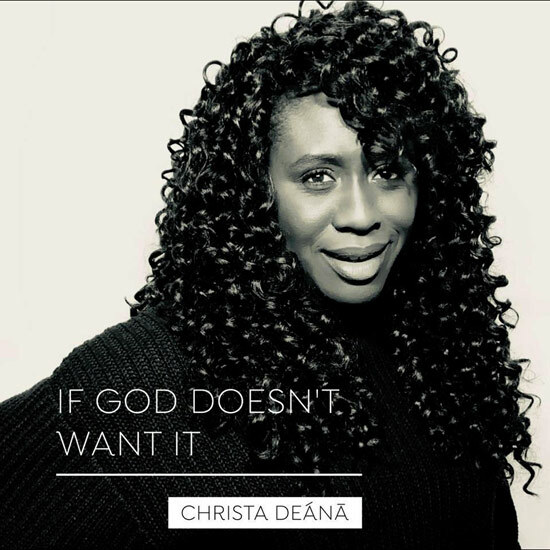 CHRISTIAN R&B/DANCE ARTIST CHRISTA DEANA RELEASES SINGLE AND LYRIC VIDEO "IF GOD DOESN'T WANT IT"
Known for her "Running Music for the Christian Walk," Christa Deana (pronounced duh-nay) has released her latest single and official lyric video, "If God Doesn't Want It." The single is available for download and streaming at all major digital outlets. Watch the lyric video at https://www.youtube.com/watch?v=VsSYxP7PHH8. Christa Deána (Duh-nay) is a Christian Singer/Songwriter from Philadelphia who sings with conviction and power. Her songs speak to the journey of a woman after God's own heart. Each song is deeply rooted in a personal, yet extremely vulnerable relationship with God. It's the beauty and emotion in her voice and the candor in her lyrics that help inspire others to go all the way, every day, with God. Christa Deána inherited perfect pitch, excellent natural timing, a powerful vocal instrument and a creative soul. But she's been diligent to cultivate her gifts, obtaining her music education degree from the University of Valley Forge. Not content to simply make her own music, she pulls beautiful music out of her students and collaborators. She is currently a music educator and worship leader at various facilities and churches. She is also the co-owner for ChristaCourt Productions.